The acorn is the fruit of the oak tree and is an extremely important ingredient in many animals’ diet. Many of the animals that make this an important part of their diet include birds, mice, squirrels, pigs, bears and deer. What makes this nut so appealing to animals is that acorns are large, abundant and easily consumed where oak trees grow. Protein levels vary among the hundred different species, but on average the acorn provides a fair amount of protein and a large amount of carbohydrates and fats as well as calcium, phosphorus, potassium and the vitamin niacin. Acorns are also easily digestible and pass easily and quickly through the system allowing wildlife to consume large amounts of acorns each day. 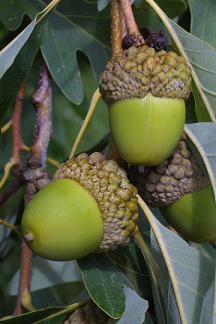 In the eastern U.S. where oak trees are abundant, the acorn is the food of choice among deer. In bumper crop years, deer will usually not travel far from the oak trees. A group of oak trees usually provide deer more than enough forage through the fall months and also provide a great deal of cover and security that the deer desires. It is often noted that during a bumper crop year, deer will rarely travel to the apple orchard, corn fields or deer feeders but will spend their days under the oak trees foraging on the acorns. Deer can gain a lot of weight and muscle very quickly during these years. Usually by mid to late fall, deer will have a thick layer of fat just under the coat and along the belly. Folklore holds that in South Texas where whitetail deer compose a large amount of their diet from mesquite beans and prickly pear their racks grow larger while in areas where acorns are more abundant, the racks are smaller but the bodies are thicker and larger. With so many species of oak trees, how do you know which is the best? It’s easy; the acorn with the lowest amount of tannic acid is the best tasting to deer. Just as humans, deer also judge their food mostly on taste and since tannic acid has a bitter undesirable taste, the lower the tannic acid level the better. The White Oak produces an acorn with the lowest levels of tannic acid; the Pin Oak comes in second, then Red Oak, Black Oak, Bur Oak and Live Oak to name a few of the most desirable acorns. However, the question remains, do deer prefer a green or a brown acorn?